One beer will be chosen in a blind taste test that includes sixteen different Central Ohio IPAs. One beer will be chosen in a Pat’s Pints reader’s poll that will be open from October 13-25. I will choose the third and final beer based on its combined performance in the reader’s poll and taste test. In Ryder cup speak, think of it as a captain’s choice. In this post I summarize the results of the blind taste test that was held at my house on Saturday, September 20. A panel of eleven judges scrutinized sixteen IPAs from Central and Southeastern Ohio and one beer was chosen to move onto the finals. In last week’s post announcing the King of Ohio IPA contest I failed to mention the back story of how this contest came to be. Its inspiration was a similar contest held last year (August 2013) involving beer bloggers and IPAs from Cincinnati. After hours of grueling work smelling, drinking, and judging beers from all over the Queen City, the participants awarded the title “King of the Cincinnati IPAs” to Blank Slate’s Lesser Path. That contest caught the attention of veteran beer writer and blogger Rick Armon (The Beer Blog), who approached Tom Aguero of Queen City Drinks and suggested that they organize a statewide version of the contest. A couple of months ago Tom contacted me and asked if I would like to participate in this ambitious endeavor. As my readers know I love blind taste tests, plus I have a ton of respect for Tom and Rick. So I agreed to participate in less time than it takes for the head to settle on a glass of Coors Light. Tom also recruited Bob Lesher from the Artful Pint to represent Cleveland and Northeast Ohio, as well as Cory Smith and Ron DeGregorio from Brew Review Crew to represent Toledo and Northwest Ohio. A contest like this is only as good as the judges involved. So I recruited eleven judges all of whom are crazy for craft brews, loopy for lupulin, and hysterical for hops. The judging panel included one BJCP certified judge, three avid homebrewers, one bar manager, and a number of people who have no official accolades but have demonstrated an unwavering commitment to drinking hoppy beers. Still it is important to point out that this is judging by a panel of everyday beer lovers, not a panel of certified judges. Judging sixteen different hop-forward IPAs presents some challenges to the palate. So I divided the beers and the judges into two groups for the first round. Mark, Hans, Ralph, Kendyl, and Andy were tasked with judging the beers in group A, while Hannah, Tom, George, Ted, Josh, and Nick were asked to do the same for the beers in group B. I was not judging in this competition but coordinating the pours and the scoring, assisted by my long-time friend Josh Goldberger. It goes without saying, but the identities of the beers were kept blind to the judges throughout the contest. Beers were served in approximately four ounce pours in pint glasses, so there was some empty glass space for capturing the volatile aromas of the IPAs. 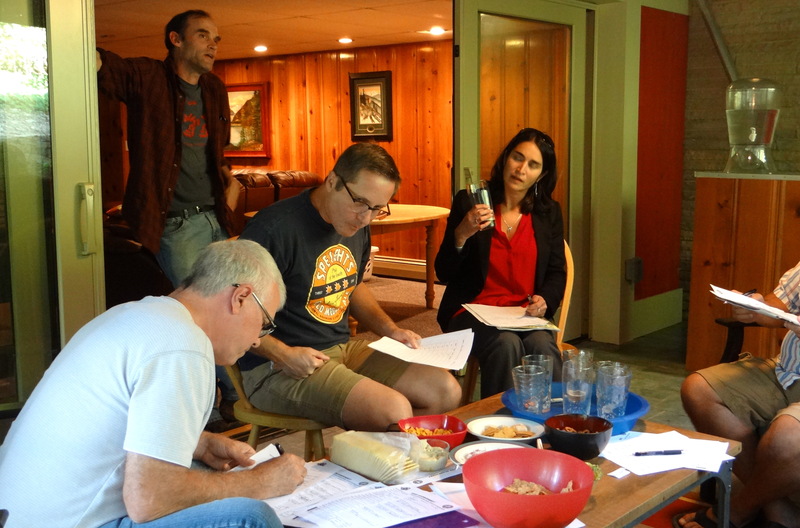 Light snacks and water were on hand for cleansing the palates of the judges between beers. Group A judging panel. 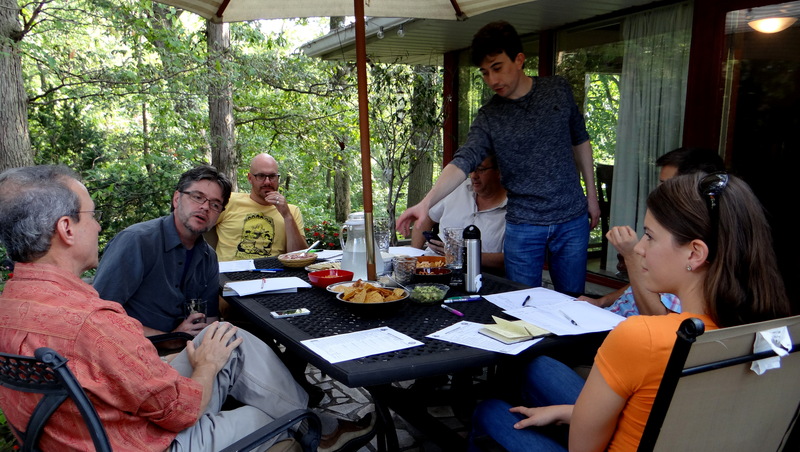 Hans waxes eloquently on mouthfeel to an enraptured audience, while Josh reaches for a chip. Each panel rated the beers blind using the BJCP scoring system (50 points in total, divided into 12 points for aroma, 3 points for appearance, 20 points for flavor, 5 points for mouthfeel, and 10 points for overall impression). The panelists discussed each beer with their fellow panelists but rated the beers individually. After tasting all eight beers each judge was asked to take his or her ratings and rank order the beers from 1 (the best) to 8 (the worst). The judges rankings for each beer were summed and the two beers with the fewest number of accumulated points advanced to the final round, where the beers were judged by all eleven judges using a similar system. Group B judging panel. George takes careful notes while Hannah and Ted debate the merits of southern hemisphere hops. To keep from further lengthening what is already a long post I limit my comments to the top four finishers in this group. 4th Place – Columbus Brewing Company IPA The most familiar and widely distributed beer on this side of the bracket, CBC’s IPA is the go to beer for me at many places around town where the craft beer selection is limited. CBC doesn’t filter this beer which gives it a characteristic hazy golden-orange hue. It’s aromatic with an aggressive piney hop nose. The hop party continues into the taste where your tongue is initially treated to a mélange of pine and citrus sensations and more than enough bitterness to let you know this is an IPA. Just when it seems like things might get out of hand everything settles down in time for a clean finish. 3rd Place – Three Frogs IPA Golden/orange in color with just the slightest haze, Three Frogs IPA entices you with an aroma that is more floral than citrus or pine. The judges commented on the nice balance between the hops and malts and the clean character of this beer. Everyone gave it high marks for drinkability, which is impressive when you consider that it is the highest abv beer on this side of the bracket. 2nd Place – Mystic Mama Golden yellow and clear, Mystic Mama has a nose that is fruity, with hints of floral and even a bit of malt sweetness in the background. The fruit flavors here lean a little toward the tropical fruit side, a couple of judges noted mango on their tasting sheets. There is a drying hop bitterness that comes in mid-palate before giving way to a lingering aftertaste that leaves you wanting more. 1st Place – Humulus Nimbus Super Pale Ale Although Seventh Son calls this a Super Pale Ale its abv is the same as the CBC IPA and well within the BJCP guidelines for an American style IPA (5.5%-7.5%), and make no mistake about it this beer is a showcase for the hops. Golden in color, Humulus Nimbus demonstrated the best head retention and lacing of any beer in this group. The aroma and taste touch all the bases you look for in a hoppy beer–citrus fruits, pine forests, and tropical fruits. The bitterness is restrained and the mouthfeel strikes the right chord, neither too watery nor too resinous with just the right level of carbonation. All five judges picked Humulus Nimbus as the top beer from this group. 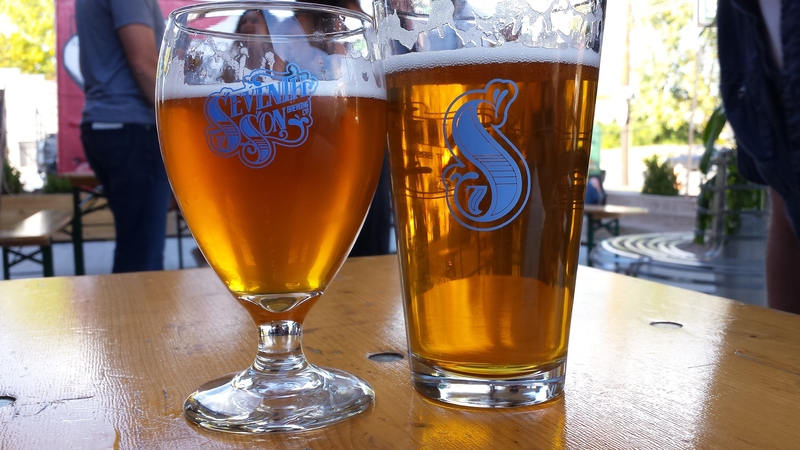 Willowood Imperial IPA (left) and Humulus Nimbus Super Pale Ale (right). Here are the tasting notes for the top four finishers in this group. 4th Place – Luck Strikes Twice West Coast IPA This beer was a little lighter in both color and body than most of the competitors. Favorable attributes included a pleasant citrus hop aroma and flavor, a slightly oily mouthfeel, and a nice clean finish. As promised in its name Luck Stikes Twice is a faithful interpretation of a west coast IPA. 3rd Place – Fisticuffs IPA The aroma of this deep golden colored beer is decidedly fruity, but instead of hitting you with grapefruits, oranges or lemons, Fisticuffs surprises you with an aroma that is suggestive of fresh pineapples. The bright, fruity hop character continues into the taste, where the bitterness is dialed in at just the right level to keep things dry and IPA-like. It may not be the most complex beer in the competition, but this tropical leaning tasty treat is the ideal pairing for your next date with a Hawaiian pizza. 2nd Place – Musk of the Minotaur My knowledge of Greek mythology is not deep enough to remember what the Minotaur is supposed to smell like, but I’m fairly confident it’s not fresh, juicy grapefruits with a hint of orange. The head retention here is impressive, and the taste has a little more complexity and depth than the Sideswipe and Wolf’s Ridge offerings. The requisite bitterness is present but dissipates at the finish and doesn’t linger or detract. Musk of the Minotaur has flavor that borders on Imperial IPA territory, with an abv and body that keep the drinkability in the traditional IPA range. 1st Place – Golden Ratio IPA Darker in color than its competitors, Golden Ratio is slightly cloudy with a deep reddish copper hue. The use of Australian Galaxy hops gives it hoppy notes that are decidedly different than the citrusy flavors traditionally found in American IPAs. The judges had some difficulty putting the flavors into words but terms like tropical fruits, dank, and piney were used by multiple judges. The malt backbone here is more substantial that any of the aforementioned beers on this side of the bracket, no doubt to the use of Ohio honey, which gives it a nice body and mouthfeel. Golden Ratio was chosen as the top beer in this bracket by 5 of the 6 judges. The scores are 1 for each judge’s favorite beer, 2 for their second favorite, and so on. 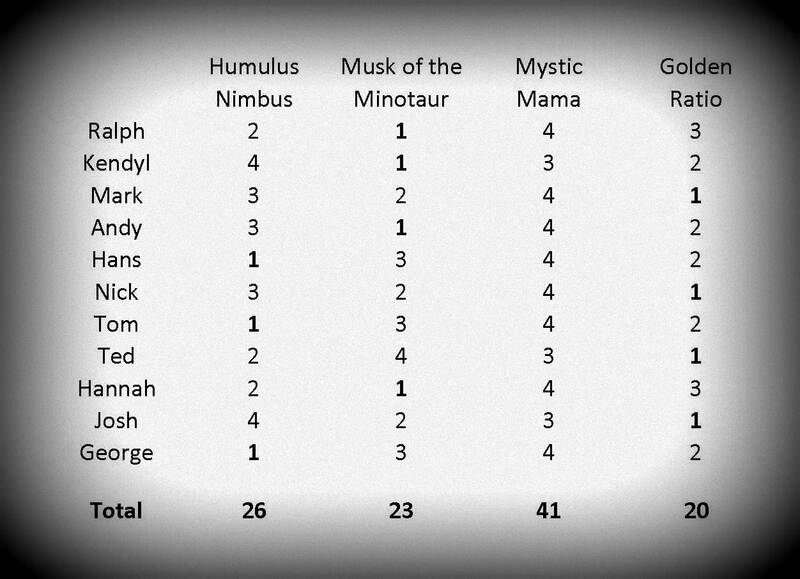 In a very tight race Golden Ratio (20 points) edges out Musk of the Minotaur (23 points) and Humulus Nimbus (26 points). Golden Ratio and Musk of the Minotaur both received four 1st place votes, while Humulus Nimbus received three. While Mystic Mama comfortably made it into the finals it struggled to hang with the other beers in the final round. In the most rigorous blind taste test that I’ve conducted to date Seventh Son’s Golden Ratio comes out on top and will be one of the beers representing Central Ohio at the finals of the “King of Ohio” IPA challenge. While there was a lot of consensus among the judges when separating the men from the boys in the opening round, the final round was almost a toss up between the top three beers. If you think your favorite beer got a raw deal here the good news is that you can come back next week and vote for the IPA that best represents Central Ohio. In fact I strongly encourage you to do exactly that. That poll will also contain a few beers not represented here because I wasn’t able to get out east to pick up IPAs from Weasel Boy (Dancing Ferret IPA) and Marietta Brewing (Happy Trail IPA). I’m also going to add Barley’s Blurry Bike IPA to the ballot. Finally I’d like to acknowledge Trevor at Hoof Hearted, Gavin at North High, Craig at Sideswipe, and Fred at Actual for donating growlers of beer for this event. Their donations did not influence the judging in any way, but their support is much appreciated. Enjoyed the read. Maybe I missed it, but was freshness verified at all? with these IPAs a matter of 2-4 weeks can make a significant difference. Good point. 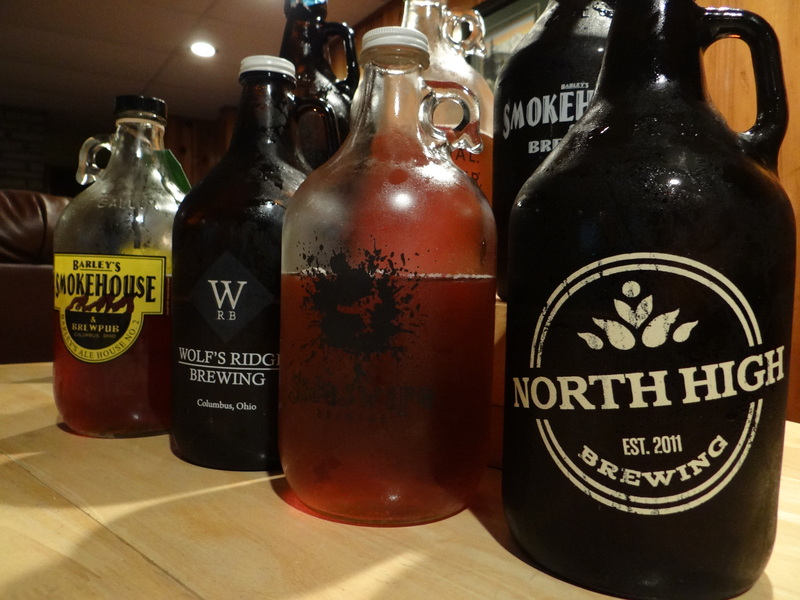 Eleven of the sixteen beers were from growlers and all of those were procured within 48 hours of the competition, kept unopened and refrigerated until the competition started. The 1805 Homestead Session IPA was purchased 8 days before the contest from a batch at Weiland’s Market that had just arrived a few days before I purchased it. The Big Star White IPA was obtained directly from Four String Brewery 10 days before the competition. The CBC IPA, Three Frogs IPA and Mystic Mama were purchased by people who attended in the week leading up to the contest, but I did not check the freshness dates on those beers. So we did our best to insure that all the beers were as fresh as possible. The only gray area is the last three beers, but in tasting them I don’t have any indication that they were sub-optimal in any way. Thanks for helping me organize and put on this event Mark. The results of a blind taste test are always interesting. I’m looking forward to see how the contest plays out from here.